2016 Global Entrepreneurship Summit – Hack Your Creative Culture! From June 22nd to June 24th, I was invited to attend and help facilitate a workshop at the Global Entrepreneurship Summit. Hosted by the White House, this summit brings together hundreds of innovators from all over the world, and is held in a different location every year. This year, President Obama brought the event to the heart of Silicon Valley at Stanford University, a place known globally for its ability to cultivate incredible entrepreneurial talent. I was invited through the University Innovation Fellows program, an organization dedicated to spreading entrepreneurship throughout higher education, who are based in Stanford University. Their training connects university students across the continent and empowers them to be effective agents of change on their campuses, putting a special focus on working with administrations and communities to create cultures and landscapes that spur the next generation of big thinkers. The program is in its 5th year and is 600-strong (and counting). I went through the training this past year and have already benefitted incredibly from it, starting the university’s first hackathon (called Hawkathon) and being more aware of the ways I can help my university flourish. The program submitted a proposal for a workshop to the State Department titled “Hack Your Creative Culture” in partnership with the Stanford d.school and Google. The event emphasized the idea that students and young entrepreneurs have the abilities to reshape their nations academic, industrial, and community organizations, and it is up to those communities and institutions to cultivate the skills and mindsets necessary for them to be changemakers. It challenged attendees to imagine how they would go back to their homes and design a culture that spurs such boundless ideation and creativity and brings out the best in their nation’s entrepreneurial talent. The program then invited 10 University Innovation Fellows to help facilitate the event, and I was honored to be among those selected. 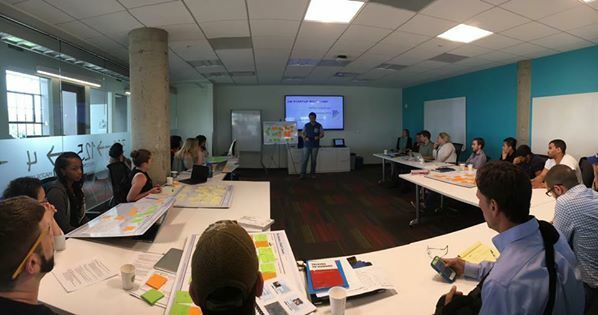 The workshop was laid out in 4 major segments – people, place, process, and purpose – which are important to keep in mind when designing a culture for creativity and innovation. Each segment of the event would include activities and presentations from the Fellows in the unique form of ignite talks. Ignite talks are pitches of ~15 slides which automatically advance every 15 seconds. This means that the presenter has to distill their message down to the core concepts, which is beneficial to the learning of both the presenter and the audience. 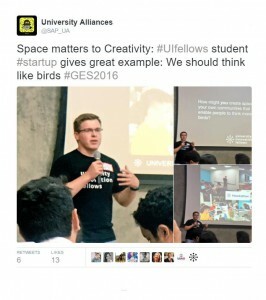 My talk was about place, and it was titled “Thinking Like Birds: Spaces for Creativity”. Weird, right? After lightly confusing my audience for the first 45 seconds as I talked about space design, I made the connection between birds and people on the creative process. Like birds, someone looking to innovate needs to find a good spot to create a team and an environment to build their idea. This spot can be called a “branch” and the environment is the “nest” where the idea (egg) can be incubated. When the idea is brought through to market viablility, it is hatched out onto the rest of the world. And much like birds, a true entreprenuer is always looking for the next spot to build a nest. In addition, I spoke to the ability of most birds to be extensively adaptable and incredible problem-solvers, both of which are qualities seen in successful innovators. I then went on to stress the importance that communities and universities build those branches for young entrepreneurs to plant their stake in. Being able to not only attend but speak at such a presitigious event was completely unexpected yet so exciting. It was invigorating to see my eccentric metaphor stick with people, and the workshop and summit overall were fantastically organized. I feel extremely lucky for having the opportunity to do this, and I look forward to getting everyone on the UMass Lowell campus to start thinking more like birds! It’s a good thing we’re already River Hawks. In preparation for the second session, all the teams were instructed to target their ideal customers and ask them questions about their product. This would give the teams a greater understanding of their target market’s opinions such as whether they would buy the product, how much they would value it, and their ideas on what could improve the product. 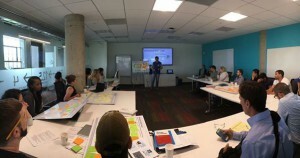 When the teams presented at the Lowell Innovation Hub, they introduced their findings and how they plan to evolve with their customers’ feedback. For example, the creator of Security Top, a device to prevent someone from drugging one’s drink, found that his customers would not want to be the only one out of their friends using the device. Therefore, it might be a better idea to sell the product to bars and clubs rather than individuals. 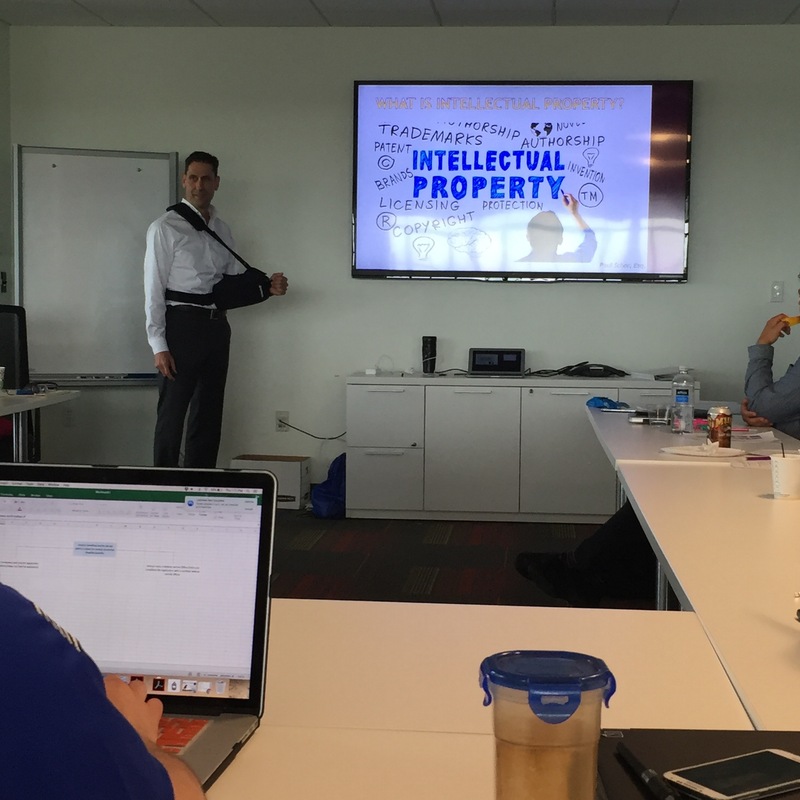 After the presentations, Paul Schor a lawyer at Gallagher & Cavanaugh LLP, gave a presentation on intellectual property and the use of patents, trademarks, etc. Within the first week of bootcamp the teams have already made great strides and improvements to their business models! A big thank you to all of this session’s special guests! On Thursday, June 2nd, DifferenceMaker teams gathered at the Innovation Hub at 110 Canal St to attend the first session of the 2016 Summer Boot Camp. Teams discussed their projects among their peers as well as several mentors, and talked more in depth about how to target customer markets and get a foot in the door in the business world. Teams will continue to gather together with DifferenceMaker staff and mentors throughout the month of June to further discuss their projects!